We are all musical beings. In our music program, we focus on developing the love of music in young children and we target the ‘process’ rather than the ‘product’. Children are not assessed according to their musical ability but rather are supported in the building of their musical profile. 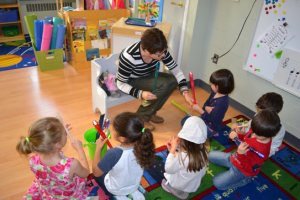 Youngest students sing French comptines and chansons, often accompanied by body movements or finger play. As children get older, they discover classical pieces, musical instruments, the scale of DO, and have a more formal study of a classical masterpiece. 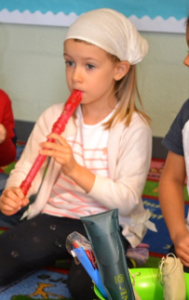 Once the children’s fine motor skills sharpen and their fingers become precise in space, the learning of the recorder is introduced. 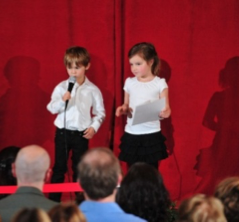 Children naturally love to play, pretend play, act, dress up, and sing. 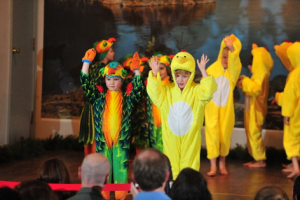 Our performance program is integrated into the curriculum and carefully crafted by teachers and children. We typically offer a Winter Concert in December and an End-of-the-year Show in May in which all students from all grades participate.